Drinking and driving is not only a big social no-no, but it can lead to devastating consequences and a myriad of expensive legal problems that can leave you buried in debt, even if you don’t hurt someone. With that in mind, in recent years there has been a spate of devices marketed toward conscientious individuals trying to do the right thing. Sure, you can always call a cab or Uber or even round up a designated driver for an evening of partying, but what if you’re feeling borderline and unsure of your capabilities behind the wheel and thinking of winging it? A temporary tattoo may be the answer. If you’re wondering how half-baked the suggestion is, you might be surprised at how relevant a temporary tattoo could be in the near future for curbing drunk driving. That’s because a group of engineers at the University of California in San Diego have created a temporary wearable to alert users of the experimental tat when they’ve crossed the line. 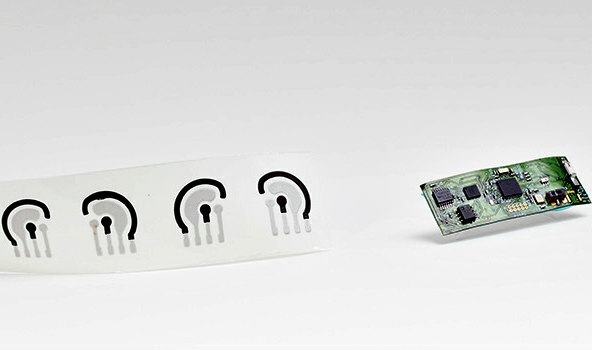 The wearable resembles a temporary tattoo that contains a sensor for detecting alcohol levels through sweat. Once it determines your blotto number it will alert your smartphone via an app and Bluetooth as to just how schnockered you really are. The rest is up to you, as far as being responsible. If you want to avoid a DUI, DWI or whatever the call letters are in your state for labeling impaired driving, then you need to make arrangements for catching a ride. The wearable can’t do everything for you, but it can give you some helpful insight as to your level of intoxication. It’s called being proactive so that you don’t become part of the problem. In as little as eight to 15 minutes, you can gauge your drunkenness and make an informed decision as to how to proceed — if you’re coherent enough to make decisions. If you’re too hammered to even consult it, then you’ve already got your answer: you’re too hammered to drive. The concept of measuring alcohol in body perspiration isn’t new. What makes this device stand out is the speed at which the tat sends signals to your smartphone to alert you of your condition. According to Seila Selimovic, Ph.D. and director of the National Institute of Biomedical Imaging and Bioengineering Program in Tissue Chips, this is how it works: It’s a small biosensor patch that is embedded with several flexible wireless components. One component releases a chemical that stimulates perspiration on the skin below the patch. Another component senses changes in the electrical current flowing through the generated sweat, which measures alcohol levels and sends them to the user’s cell phone. The makers of the patch declare that the results are accurate, so it’s a good idea to know your state’s blood alcohol level legal limits if you’re somebody who has a tendency to push the envelope. The group’s work, led by nanoengineering professor Joseph Wang and electrical engineering professor Patrick Mercier, both at UC San Diego, was published recently in the journal ACS Sensors, if you’d like to learn more about it. In the meantime, until a device like this becomes available to the public, please drink responsibly.